Credit cards have become an important part of daily living, and several people simply cannot imagine life without credit. However, if you fail to chose the right card or find out everything about it, including the things in fine print, you could get into serious financial trouble. You might even find yourself up to your ears in credit card debt before you know it. The wrong variety of credit card in the hands of someone who purchases things he/she does not need on impulse means real trouble. 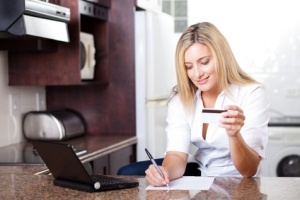 Fortunately, you can easily get out of credit card debt if you take into consideration the following steps. You should have a real burning desire to become free of debt. Paying off your credit card debt should become the most important thing in life for you. In fact, you should be able to sacrifice all the little luxuries of life till you become free of debt and use almost every penny to pay off those credit card debts. Take a pair of sharp scissors and cut up all your credit credits, but leave just one of them hidden in a safe place for emergencies. The first step to getting out of credit card debt is to stop making any more purchases on your credit card. If you don’t have the heart to cut them up, you can at least stop carrying them in your wallet or pocket and keep them in a safe place at home. Pay off the smallest credit card debt first because the smallest debts are always the easiest to pay. Moreover, you will feel a sense of achievement at having paid off at least one debt and this will inspire you to tackle the larger credit card debts. Make your credit card payments twice a month instead of once at the end of the month because it is easier to make two small payments instead of one large payment. Besides, you will be reducing your average daily balance by making two payments per month instead of one. Whenever you come into any money, use it to pay off your credit card debts, irrespective of how small it may seem. Every penny adds up, and you will find yourself to be free of debt in no time. Credit card experts usually advice people against closing their credit cards accounts because it affects their credit card score. If you must close your account to avoid getting into more debt, make it a point to close your new accounts, and as far as possible, avoid closing the old ones. FICO scores are usually calculated on the basis of how long you hold a credit card account, and if you close your old account, your score will get badly affected. There are plenty of free Internet resources telling you how to get out of credit card debt; besides, you can also read useful books such as Dave Ramsey’s The Total Money Makeover.